Videogames can change a person's brain and, as researchers are finding, often that change is for the better. People who played action-based video and computer games made decisions 25% faster than others without sacrificing accuracy, according to a study. Indeed, the most adept gamers can make choices and act on them up to six times a second—four times faster than most people, other researchers found. Moreover, practiced game players can pay attention to more than six things at once without getting confused, compared with the four that someone can normally keep in mind, said University of Rochester researchers. 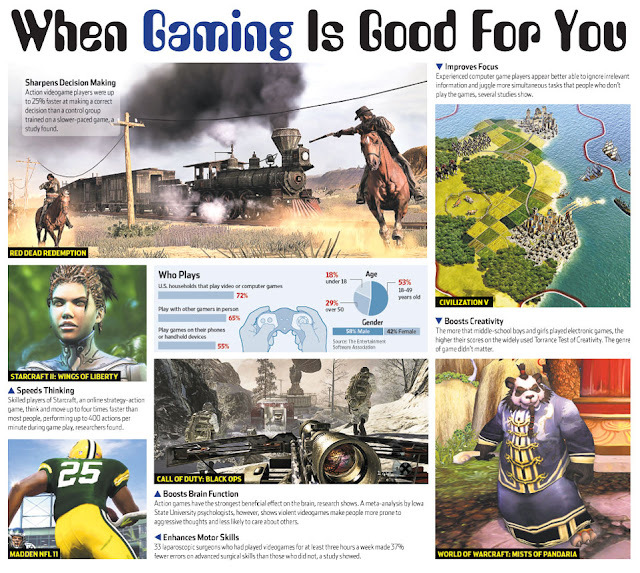 The studies were conducted independently of the companies that sell video and computer games. Scientists also found that women—who make up about 42% of computer and videogame players—were better able to mentally manipulate 3D objects, a skill at which men are generally more adept. Most studies looked at adults rather than children. Electronic gameplay has its downside. Brain scans show that violent videogames can alter brain function in healthy young men after just a week of play, depressing activity among regions associated with emotional control, researchers at Indiana University recently reported. Other studies have found an association between compulsive gaming and being overweight, introverted and prone to depression. The studies didn't compare the benefits of gaming with such downsides. 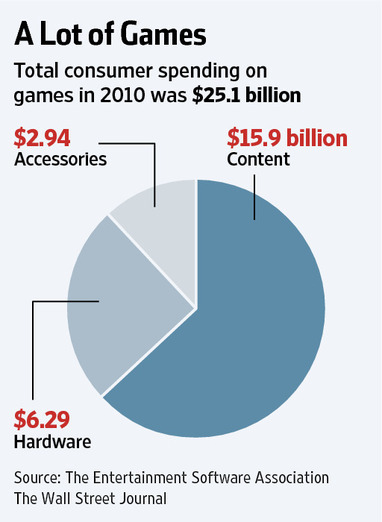 Computer gaming has become a $25 billion-a year entertainment business behemoth since the first coin-operated commercial videogames hit the market 41 years ago. 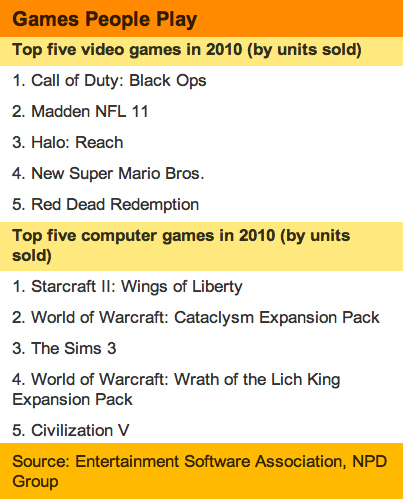 In 2010, gaming companies sold 257 million video and computer games, according to figures compiled by the industry's trade group, the Entertainment Software Association. For scientists, the industry unintentionally launched a mass experiment in the neurobiology of learning. Millions of people have immersed themselves in the interactive reward conditioning of electronic game play, from Tetris, Angry Birds, and Farmville, to shooter games and multiplayer, role-playing fantasies such as League of Legend, which has been played 1 billion times or so in the two years since it was introduced. "Videogames change your brain," said University of Wisconsin psychologist C. Shawn Green, who studies how electronic games affect abilities. So does learning to read, playing the piano, or navigating the streets of London, which have all been shown to change the brain's physical structure. The powerful combination of concentration and rewarding surges of neurotransmitters like dopamine strengthen neural circuits in much the same the way that exercise builds muscles. But "games definitely hit the reward system in a way that not all activities do," he said. "There has been a lot of attention wasted in figuring out whether these things turn us into killing machines," said computational analyst Joshua Lewis at the University of California in San Diego, who studied 2,000 computer game players. "Not enough attention has been paid to the unique and interesting features that videogames have outside of the violence." Broadly speaking, today's average gamer is 34 years old and has been playing electronic games for 12 years, often up to 18 hours a week. By one analyst's calculation, the 11 million or so registered users of the online role-playing fantasy World of Warcraft collectively have spent as much time playing the game since its introduction in 2004 as humanity spent evolving as a species—about 50 billion hours of game time, which adds up to about 5.9 million years. With people playing so many hundreds, if not thousands, of different games, though, university researchers have been hard-pressed to pinpoint the lasting effects on cognition and behavior. Blizzard Entertainment Inc. in Irvine, Calif., which sells World of Warcraft, StarCraft II and other popular games, did not respond to queries about whether the company supports gaming research or conducts its own studies. Neither did RiotGames Inc. in Santa Monica, which markets League of Legends. The vast majority of the research did not directly compare gaming with hours of other intense, mental activities such as solving math equations. Almost any computer game appears to boost a child's creativity, researchers at Michigan State University's Children and Technology Project reported in November. A three-year study of 491 middle school students found that the more children played computer games the higher their scores on a standardized test of creativity—regardless of race, gender, or the kind of game played. The researchers ranked students on a widely used measure called the Torrance Test of Creativity, which involves such tasks as drawing an "interesting and exciting" picture from a curved shape on a sheet of paper, giving the picture a title, and then writing a story about it. The results were ranked by seven researchers for originality, length, and complexity on a standardized three-point scale for each factor, along with detailed questionnaires. In contrast, using cellphones, the Internet, or computers for other purposes had no effect on creativity, they said. "Much to my surprise, it didn't matter whether you were playing aggressive games or sport games, not a bit," said psychologist Linda Jackson, who led the federally funded study of 491 boys and girls at 20 Michigan schools. Even so, researchers have yet to create educational software as engaging as most action games. Without such intense involvement, neural circuits won't change, they believe. "It happens that all the games that have the good learning effect happen to be violent. We don't know whether the violence is important or not," said Dr. Bavelier. "We hope not." Until recently, most researchers studied the effects of gaming on small groups of volunteers, who learned to play under laboratory conditions. Some scientists now are turning the commercial games themselves into laboratories of learning. 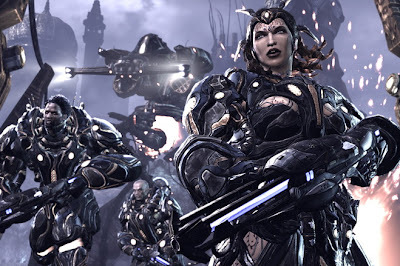 In the largest public study of electronic gaming so far, Mark Blair at Simon Fraser University in Vancouver, British Columbia, is analyzing the behavior of 150,000 people who play the popular online game called StarCraft II, pulling together more than 1.5 billion data points of perception, attention, movement and second-by-second decision-making. By analyzing so much game play, he hopes to learn how people become experts in an online world. That may shed light on how new knowledge and experience can become second nature, integrated into the way we react to the world around us.